Il Bianco (“the white”) is a high-quality bittersweet condiment made from white grapes in the Cremonese tradition. 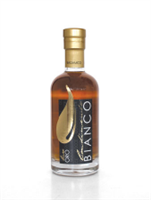 Is obtained from the concentrated must of white grapes only, mainly Spergola and Trebbiano, and expertly blended with the finest white wine vinegar. COLOR - Clear and transparent; amber-golden tone. TASTE - Dry and lively but well balanced. The sensation of volatile acidity is pronounced while maintaining a pleasant hint of sweetness. The White is a Premium Bittersweet White Condiment , it is the result of the slow aging of white grape concentrates blended with premium mature white wine vinegar. Our White Condiments has a warm limpid amber hue and a sweet, tart citrusy flavour that delights the palette. With its tart aroma and transparent quality, the White makes the seasoning of choice when the desire to preserve the colours of the main dish is paramount. It’s a perfect companion to fresh salads and vegetables. Excellent on fresh seafood, shellfish and white meats. COLOR - Limpid and transparent with an amber hue. AROMA - Full flavoured, intense and long lasting with a hint of white grape. FLAVOR - Dry, lively yet balanced with a memorable sweet grape aftertaste. INGREDIENTS - Slow cooked must from Italian White Grapes, white wine vinegar, aged shortly in wood barrels of white oak. Premium Bittersweet White Grapes Precious Condiment Terra del Tuono Violet Label is the result of the slow aging of white grape concentrated musts blended with premium mature white wine vinegar. All the grapes in our musts are from Italy. Our Balsamic Seasoning has a warm limpid amber hue and a sweet, tart citrus flavor that delights the palette. AROMA - Full flavored, intense and long lasting with a hint of white grape. ACCOMPANIMENTS - Our white condiment, with its tart aroma and transparent quality, makes it the seasoning of choice when the desire to preserve the colors of the main dish is paramount. It's a perfect companion to fresh salads and vegetables. Excellent on fresh seafood, shellfish and white meats.